Spetses passenger and car ferry ticket prices, timetables, ticket reservations and information for ferries sailing from Spetses to Ermioni, Hydra, Piraeus, Poros and Porto Heli. Compare all available Spetses ferry ticket prices in real time and book the cheapest available Spetses car and passenger ferry tickets sailing to and from Spetses, Ermioni, Hydra, Piraeus, Poros and Porto Heli with Hellenic Seaways ferries online with instant confirmation. Book Spetses Ferry Tickets with Hellenic Seaways for ferries sailing from Spetses to Ermioni, Hydra, Piraeus, Poros and Porto Heli online in advance to enjoy the cheapest available ferry ticket price. The price you see is the price you pay. There are no hidden extras or surprises such as added fuel surcharges or booking fees and we do not charge you anything extra for paying with a Visa Electron card. The price we quote you for your selected Spetses passenger or car ferry ticket, onboard accommodation and vehicle type is all you will pay, and that's a promise. To obtain a Spetses ferry ticket price and book your ferry ticket securely online please use the real time ferry booking form on the left. You are also able to add a hotel at your destination, or anywhere else, to your ferry ticket when completing your ferry ticket reservation. Spetses is a small pine forested island that has proved to be popular with English tourists for many years. It can be reached via daily ferries from the Athenian port of Piraeus, or by taking a water taxi from the nearby village of Kosta on the Greek mainland. There is at present a limited ban on the use of private cars on the island. Spetses town, sometimes called Dapia after the name of its port, is the only substantial settlement on the island. With the lack of private motor cars, the town exudes a more relaxed atmosphere than can be found on many other islands. The horse and traps that run back and forth along the water front only adds to the feeling that this could be a good place to simply lay back and relax. Apart from the main square, it is, in many ways not the prettiest of Greek towns, but it still houses many fine old mansions. Around the old harbour can be found the usual mix of tavernas and bars, but as the resort is also very popular with some of the more well to do Athenians who own villas on the island, prices can be higher than you would normally expect to pay on the average Greek island. 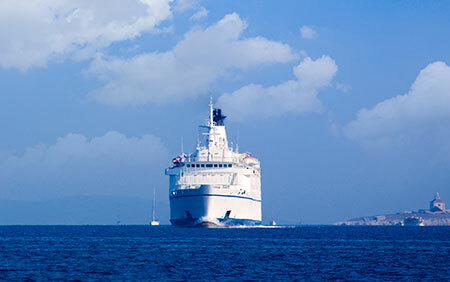 The preferred method of travel from Athens to Spetses is by sea from the port of Piraeus. In high season several passenger-only hydrofoils and catamarans of Hellenic Seaways depart the port of Piraeus daily, calling at the the islands of Poros, Hydra and Spetses, as well as the mainland ports of Ermioni and Porto Heli on the Peloponnese. Depending on the ports of call, trip duration from Piraeus to Spetses is between 1 hour 45 minutes and 3 hours 15 minutes. Passenger tickets cost €35 one way. The daily ferry links Spetses to Piraeus (4,5hours) via Hydra (1 hour), Poros (2 hours) and Aegina (3 hours). In summer, taxi-boats reach Kosta in the Peloponnese in 10 minutes. A ferry effectuates the same trip every day at 7.15 am, 10 am, 1 pm and 4. 30 pm. Nine daily Flying Dolphins (hydrofoil ferries) link Spetses to Piraeus (2,5 hours), via Hydra (30 minutes) and Poros (70 minutes). In high season (from July until the beginning of September) daily services are operating to Leonidio (1 hour) and Monemvasia (1,5 hours) in the Peloponnese. Winter sees a major reduction in service, with only four hydrofoils daily. These are subject to cancellations when the weather turns nasty. Only the regular ferry carries motorcycles and bikes to Spetses. Private cars are not officially allowed on the island. The celebrations of the Panaghia Armata are the highlight of the summer season on Spetses, attracting as many as 40,000 visitors, and culminating in the re-enectment of an 1822 naval battle between the Greek forces and the Turkish Armada. The show includes an attack on the Turkish flagship with a Greek fire-boat, which sets off a fascinating show of fireworks in the harbour of Spetses Town. The week-long celebrations culminate on the second weekend of September each year, and also include concerts and other cultural events. A special mass is held in the church of Panaghia Armata in the Old Harbour, as well as at Aghios Nikolaos, the metropolis of the island. Easter is also a very popular time for visiting the island. Holy Week traditions are lovingly passed on from generation to generation, with the highlights being the Good Friday mass, where funeral processions from all parishes converge on Spetses Town for a final open-air mass, and the Saturday midnight celebrations of the Resurrection with fireworks (before everyone returns home for the traditional feast that marks end of a 40-day fast). Accommodation during the Easter and Armata weekends can be impossible to find, unless booked well in advance. Lighthouse on the Old Harbour headlandA walk to the Old Harbor is considered a must for visitors to the island. The coastal road is closed to vehicles in the evenings during summer season, making it a pleasant outing all the way from Spetses Town, past some of the most spectacular mansions, and on to the marina with all the luxury yachts and cruisers of the wealthier holidaying Athenians, all the way to the little churche of the Panaghia Armata and the Lighhouse--one of the first to be built in Greece, in 1837, and still in use. At a leisurely pace the walk from the new Dapia harbor at the town center to the Old Harbor shouldn't take more half an hour each way. Cafes, bars and restaurants abound in the Old Harbor. Some of the best beaches can be reached via the boats that leave the harbour each morning during the holiday season. The best beach on the island is usually considered to be Agia Anargiri on the opposite side of the island from the main town, here there are a couple of good tavernas, and watersports in the high season. Sea entrance to the Bekiris CaveThe island's most popular beaches are Aghioi Anargyroi and Aghia Paraskevi, on the west side of the island. A bus and tourist boats run daily from Spetses Town during the summer season. An acceptable, if somewhat touristy, self-service restaurant operates in-season at Aghioi Anargyroi. The Bekiris Cave at Aghioi Anargyroi, complete with its own sandy beach, is a must-see. Access is overland from the northern edge of the Aghioi Anargyroi beach, or else you can swim inside through a very low opening. The cave served as a hideout for women and children during Turkish attacks on the island. The very picturesque Zogeria Beach, on the north edge of the island, is also served by tourist boats from the island and boasts a restaurant, serving its specialty of chicken in tomato sauce with spaghetti or chips. Other beaches on the island, such as Xylokeriza, Ligoneri and Vrellos are only accessible by private transport (motorbikes or bicycles) or with very expensive sea taxis. Best Price Guarantee - We always offer you our lowest available Hellenic Seaways passenger and car ferries ticket price to and from Spetses. There are no hidden extras or surprises such as added fuel surcharges or booking fees and we also we do not charge you anything extra for paying with a Visa Electron card. The price we quote for your selected Spetses ferry ticket, onboard accommodation and vehicle type is all you will pay, and that's a promise! In the unlikely event you find the same all inclusive Spetses ferry ticket cheaper in the brochure of any other tour operator we promise that we will do our best to beat that price or offer you the choice of requesting a refund. To book Spetses car and passenger ferry tickets please click here. At ferryto.co.uk you are able to obtain live Spetses ferry ticket prices, check availability and book car and passenger ferry tickets to and from Spetses at our lowest available ticket price. Ferryto.co.uk is part of the world's largest online ferry ticket distribution network providing the ability to book over 80 major European ferry operators including to Spetses and to over 1,200 other ferry routes throughout the UK, France, Spain, Ireland, Holland, Eastern Europe, the Mediterranean, the Baltic and North Africa.